The collaboration app Drawp for School has arrived for Android. Previously, it had only been accessible via iPad. The app works almost like an interactive whiteboard, letting teachers import materials for lesson creation and annotation. 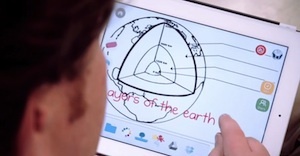 Users can layer text, drawing, or voice on top of their lessons and push them out to student devices. Students can then view the lesson and complete any assignments of their own, which can be uploaded to a private cloud and shared back with teachers who can add their own comments. Designed as a way to facilitate student-teacher collaboration, the app also provides teachers with tools to organize and store assignments. Parents can also be brought into the fold, and can receive marked-up assignments directly on their devices. "Management is key to making tablets a successful learning tool for my classrooms," says Emily Bradley of Angleton, Texas' Westside Elementary in a statement. "Drawp is user-friendly and it makes it easier for me to keep up with students' work, as well as for them to share work with one another. It also helps me with assignments, and inspires creativity in the kids as well." Subscriptions for teachers start at $39.